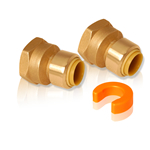 Now you can have a water heater installation kit to make installations a snap...literally. Just cut, clean, mark, and push the fitting on for easy water heater installation with no solder. Straight Male Push Connect™ Adapter 1" PC x 3/4" MNPT 1/2" Push Angle Valve x 1/2" FIP x 12" Faucet Connector Hose, EPDM Seal - Lead Free Faucet Push Connect Push Reducer 1" CTS x 3/4"
Push Connect™ Elbow Fitting 1" x 1" PC Elbow Lead Free Push Connect Tee 1" x 1" x 1" Lead Free Water Hammer Arrestor 1" x 1"